During our days out on holiday we spent quite a lot of time just driving around. The weather was entirely perfect every day and we all enjoyed just being somewhere where there were no people and often no birds or animals either. There aren’t many places in England where you an drive around for an hour or two and not see anyone. Of course though the moors are not picturesque in a barren sort of way, they weren’t always quite so empty of people. Since before Roman times these areas have been mined for their precious minerals and coal and it was the coal from these areas that largely powered the Industrial Revolution and the rise of Britain in the last few centuries. These days if you know what you’re looking for the terrain is still littered with unexplainable hillocks and small stone buildings and though some of these are bothies (places where shepherds or walkers traditionally sought shelter), most of them are mines. 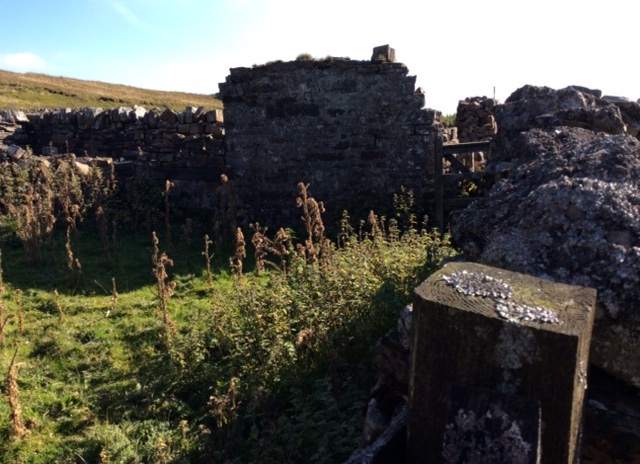 The photo above is of a well-preserved mine entrance, the actually entrance to the shaft having been sealed to stop idiots like me and sheep going off exploring. Some mine were very small and only employed a handful of men for a few years whilst others were bigger. 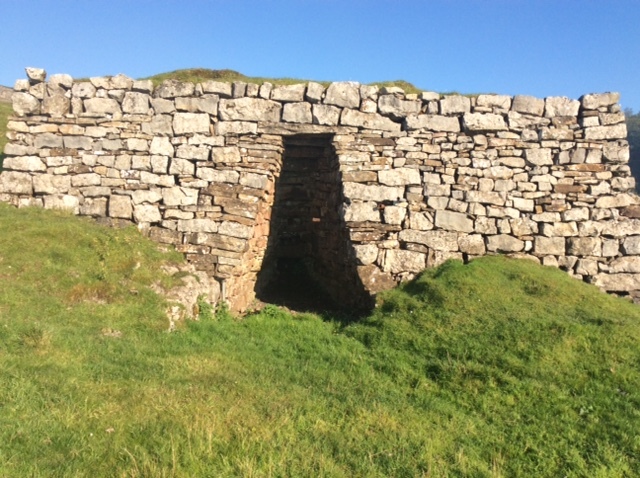 Sometimes the stone from the buildings was re-appropriated for other buildings. These photos show the remains of a more substantial mining complex. Now ruined by years or possibly centuries of neglect. 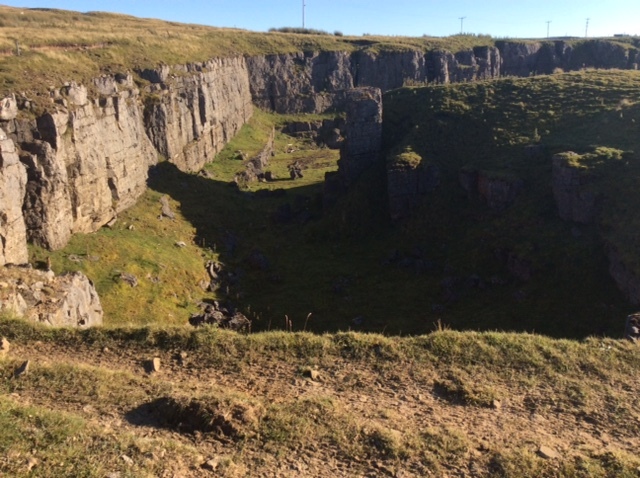 Abandoned mine – the entrance is somewhere down under our feet. The deep gulley also contains a stream. Mines made great use of water to power wheels and power early industrial equipment as well as to clean and separate the material being mined from general soil and rock. 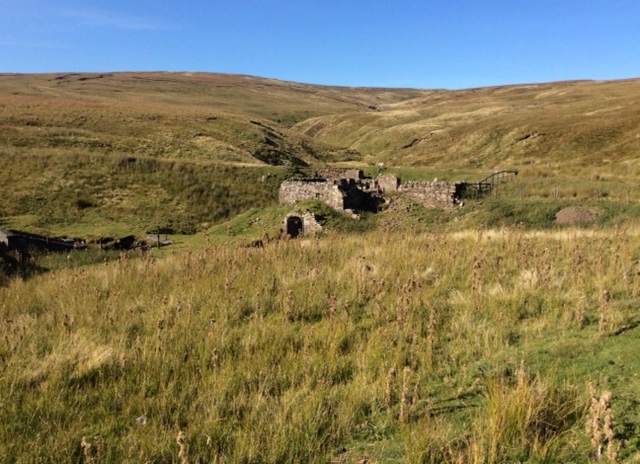 Of course some mines employed many thousands of men in more recent centuries although almost all of these were closed in the 1980’s in a highly controversial economic and political policy to close them down by Prime Minister Margaret Thatcher as apparently it is better to get import our coal from Australia and such secure places as Russia. As a result many areas were left entirely deprived with not a single income earner amongst entire streets. Only in recent years have some of these places started to recover. 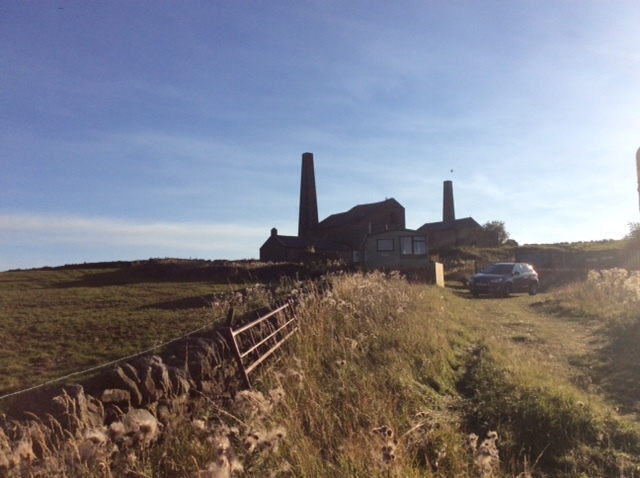 This mine above is one of the best preserved Victorian era mine not too far from the towns of Hexham and Allendale. It has been granted a listed heritage status which means though it can be re-developed into a museum or an outdoors centre or even housing, it has to be preserved. 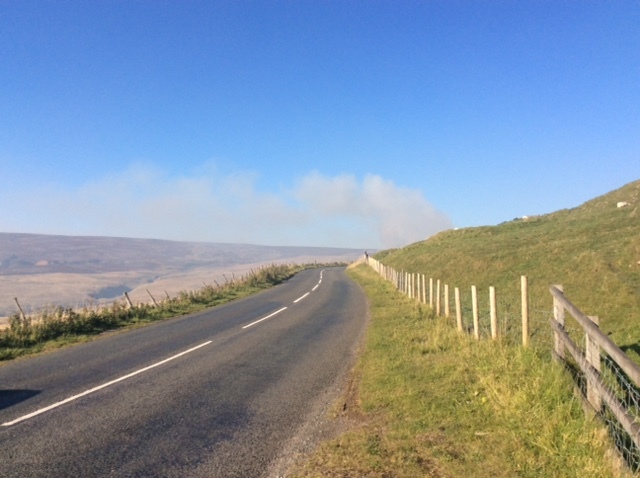 Sections of the moors on the left are being burned under controlled conditions. As well as sheep farming, large areas of the moors are breeding grounds for Grouse, a type of large and not particularly clever game bird. They nest and bread in the heather, bracken and gorse and are a big source of income to farmers as a certain type of person will come up here from the cities and hunt them. However the birds do best if the heather is young so by burning the heather, it grows more vigorously. 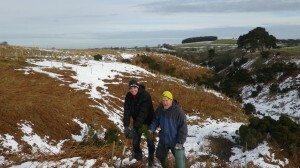 Great care has to be taken though as the heather is very dry and grows on a very peaty soil and fires can spread…. like wildfire with the peaty soil itself burning underground and spreading for miles in dry weather or if hikers drop cigarettes or glass bottles. In parts of the northern UK, peat was a popular source of fuel for burning and cooking with if one couldn’t afford coal or find wood. This looks like an old quarry but there are places where the rock naturally comes out of the ground on long cliffs down locally as Sills or Scars. 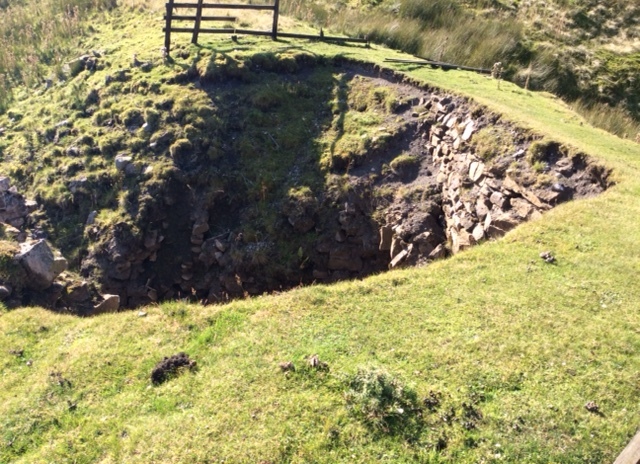 The photo shows though how thin the soil is to the bedrock and how even without the climate, it is only “good” for sheep farming. Of course after the last ice-age nearly all of Britain was covered in forest and there are many areas around here with very deep gorges where even small rivers have calved away the soil which now has nothing much to keep it together. One thing I have noticed is that a lot more of these areas are being planted with trees compared to 20 years ago in attempts to hold the soil together, improve wildlife and even on a large scale, moderate the local climate. This entry was posted in Northumberland and Durham, Photography, Travel, Ye Olde England Tours and tagged Culture, Heritage, history, holidays, Industry, Mining, Moors, North Pennines AONB, Photography, ruins, Tours, Travel, Ye Olde England Tours. Bookmark the permalink. Eerie and desolate. Perfect places for a murder mystery. I was just thinking that Malla. Sometime in my future, I must find time to write a period mystery book set around here. Thanks Glenn, I’m glad you enjoyed it. I did a few other posts that week on similar theme she so I hope you enjoy them too.